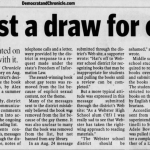 (October 27, 2006) — WEBSTER — Webster Central School District officials received at least 19 comments about the decision to pull an award-winning book off a summer reading list in August. Only one comment supported the district’s decision, but many of the critics were confused about exactly what the district did and why. 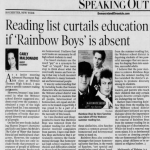 The comments were sent to the district after the Democrat and Chronicle published a story on Aug. 24 about the district’s decision to remove the book Rainbow Boys, by Alex Sanchez, from a summer reading list. 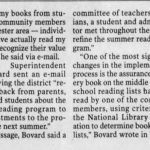 Ann Carmody, district director of communications, said the comments would be taken into account during the ongoing review of the reading list. The comments contained in e-mails, messages submitted through the district’s Web site, notes of telephone calls and a letter, were provided by the district in response to a request made under the state’s Freedom of Information Law. 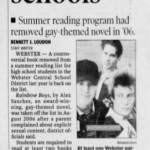 The award-winning book about gay teens was removed from the list because of explicit sexual content, not the theme. 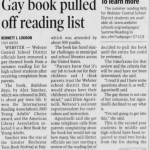 Many of the messages sent to the district mistakenly believed the book was removed from the list because of the gay theme. 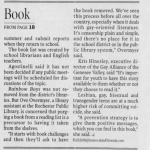 It was also unclear to many that the book was removed from the list, but not banned from any library. 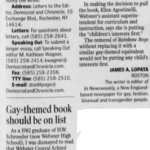 “The Webster school district should be ashamed,” another person wrote. Middle school and high school students were required to read at least two books over the summer and submit reports about the books in September. The students were not restricted to reading only books on the list prepared by English teachers and librarians. 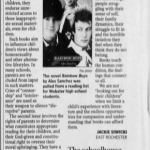 According to an e-mail sent from then-assistant superintendent Ellen Agostinelli to Superintendent Adele Bovard, the book was pulled from the list after a complaint from the father of a 12-year-old girl who checked the book out of the Webster Public Library and was disturbed by the sexually explicit nature of some passages. 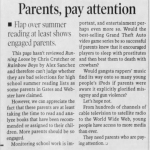 The girl’s father “acknowledged that she mistakenly selected a high school level book (labeled at a high maturity level, at that), but we both agreed that it still is inappropriate,” Agostinelli wrote in an e-mail. “It was removed from the booklist and the Web site before I returned his call, which he liked,” Agostinelli wrote in an e-mail to Bovard.